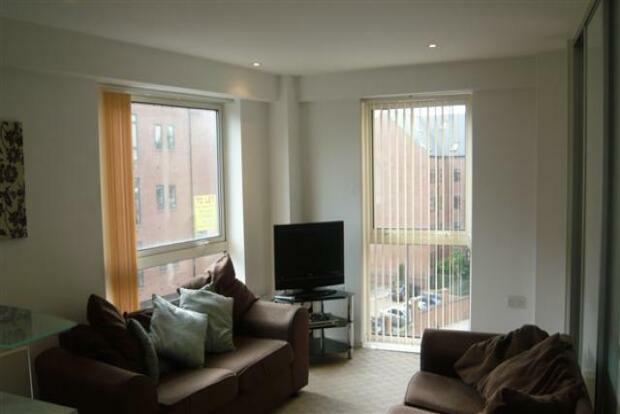 2 Bedroom Apartment To Rent in Leeds for £800 per Calendar Month. Immaculate two bedroom apartment based in the popular Trinity One development, walking distance to the heart of the city centre. This two bedroom property is offered fully furnished and is in an immaculate condition having been newly redecorated. The internal accommodation comprises of entrance hallway with spacious storage cupboard, leading through to the well-equipped kitchen with integrated appliances and breakfast bar. The living room is open plan to the kitchen and has a feature wall and floor to ceiling windows. the master bedroom is tastefully decorated with high-specification en-suite shower room. There is a second bedroom, this would be ideally used as a guest bedroom or study area as this is access via a sliding door form the living space. Accessed from the internal hallway is the second bedroom which benefits from floor to ceiling windows and the family bathroom which incorporates beautiful tiling and a bath.